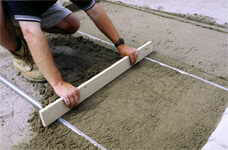 1” screeded sand bed (# 10 screenings are not acceptable for sand bed) must be concrete sand. After the pitch of the final brick grade is determined and the area is excavated 6“ wider and longer than the actual brickfield and to the proper depth, the sub grade (or bottom of the excavation) is compacted with a plate tamper. The base stone is then brought in and graded in 2 to 3 “lifts.” A lift is a term for a compacted layer of stone at a 2-3” depth. If a project that requires 6” of base stone is not compacted in lifts (all stone brought in and compacted on top) only the top 3” of stone will achieve complete compaction and brick settlement may occur. A thin layer of mason sand is coated over the installed brick surface. Then a plate tamper is used again to set and lock the bricks. As the bricks are forced down by the pressure, the sand below is forced up (displacement) through the seams and the sand on top settles down. This is where the inter-lock takes place. (hence the name “interlocking brick pavers“) More sand is swept into the surface seams until completely full from top to bottom of brick. 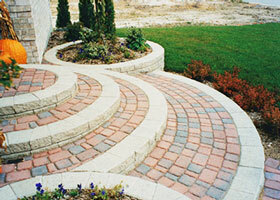 Keeping pavers free of debris with regular sweeping will help maintain your pavers original beauty. The frequency of cleaning sealed pavers depends on the amount of traffic and stains they receive. Using a cleaning solution on a regular basis helps prevent stubborn stains from penetrating, making them difficult to remove later.